The Fluffy Jackets would like to pass on our sincere condolences to the friends and family of legendary guitarist Roland Janes who passed away 18 October 2013 at the age of 80, following a heart attack. Roland Janes was a regular session guitarist at Sun Studio between 1956 and 1963 where he recorded on hits by Jerry Lee Lewis, Billy Lee Riley, Charlie rich, Sonny Burgess and many others. After Sun, he became a master producer and engineer at various studios. He began working with Sam Phillips again in 1982, at Phillips Recording Studio, just a few blocks away from the original Sun Studio building. It was at Phillips Recording Studio that we (The Fluffy Jackets) got the opportunity to meet and talk to Roland. It was such a joy and privilege to meet him, and we are still grateful to Robert Hall (drummer with Jerry Lee Lewis) for introducing us. When we got into the studio, he was sitting behind the mixing desk, doing what he liked best / producing music. 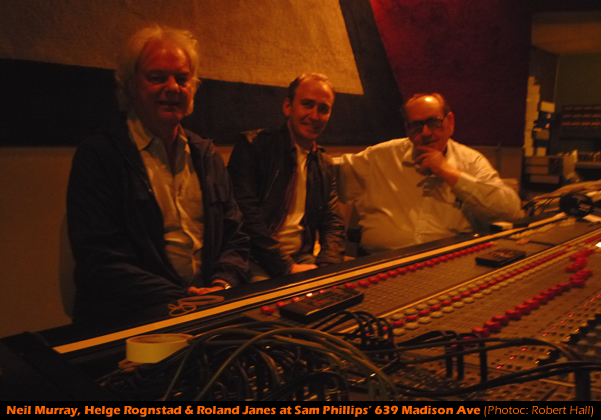 We took the picture of Roland Janes sitting with Neil Murray and Helge Rognstad / it is a treasured memory for us. Janes was recently elected to the Memphis Music Hall of Fame and was scheduled to receive a Brass Note on Beale Street. He is survived by his wife of 54 years, Betty, two sons, a daughter, eight grandchildren and three great grandchildren.